Kitty Hawk Kites held its 12th Annual OBX Watermelon Festival on Aug. 1 at Jockey’s Ridge. As in the past, this year’s event was a great success and all proceeds went to the Outer Banks Bicycle and Pedestrian Safety Coalition. Visitors participated in watermelon stacking, watermelon eating, seed spitting and ice cream eating contests. All attendees were greeted by the North Carolina Watermelon Queen Amy Arnold of Little Washington. The Outer Banks Bicycle and Pedestrian Safety Coalition was formed in 2013 after several severe crashes on the Outer Banks involving pedestrians and bicyclists. Its members stretch from Corolla to Hatteras including several town officials, many law enforcement officers from several towns, local citizens, and many business leaders from major employers throughout the Outer Banks. 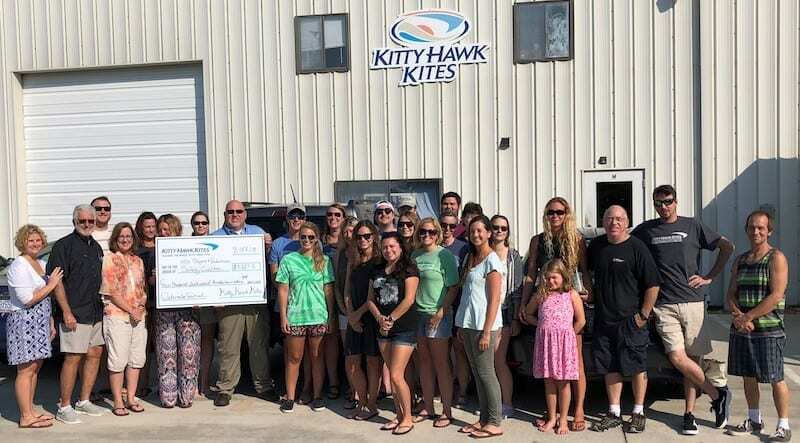 John Harris, the owner of Kitty Hawk Kites, is a founding member of the Coalition. The generosity he shows by presenting a check to the Coalition each year allows its member to provide outreach to all the communities on the Outer Banks. The next project the Coalition is going to tackle is its Lights & Lids for Kids program. This program through the assistance of local businesses will provide each child, grades K-8, in Dare County with a free helmet and lights for their bicycle. Stay tuned to the Coalition’s Facebook page for more information.